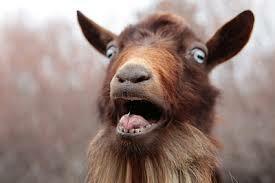 If you depend on a morning cup of coffee to get the old blood flowing, you can thank a bunch of frolicking goats. According to legend, coffee was discovered more than a thousand years ago by a sleepy-eyed goat herder who noticed that a certain berry gave his goats insomnia. After making himself a berry brew–and spending the night dancing with goats–he named the concoction Kahwa, the Arab name for wine. Though coffee became the drink of choice for rebels after the Boston Tea party, its appeal was limited. Sold green, the chore of roasting beans baffled housewives and chuck wagon cooks alike. According to one old timer, beans had to be clean-picked, placed single layer in a roasting pan and stirred constantly. One burned bean would ruin the whole batch. Once the beans were roasted, they quickly lost flavor and aroma. The short shelf-life meant that roasted beans could be sold only in big cities. John Arbuckle, a Philadelphia grocer, had an idea. Why not coat the roasted beans with something to keep them from deteriorating? He bought a roaster and got to work. He tried coating roasted beans with a glaze consisting of Irish moss, gelatin, isinglass, white sugar and eggs and it worked. Eventually, this glaze was simplified to only white sugar and eggs. This coating allowed him to ship roasted beans all over the country. Not only did John Arbuckle solve the roasted bean problem, he pretty much invented the whole concept of marketing. He was the first to use premiums to encourage the sales, and a peppermint candy was included in each pound bag. “Who wants the peppermint?” was a familiar cry around chuck wagons. This call to grind the coffee beans got a rash of volunteers. No rough and tumble cowboy worth his salt would turn down peppermint candy. 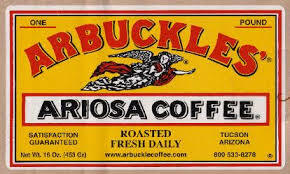 Not one to rest on his laurels, Arbuckle changed the company name to Arbuckles to include his brother, and came up with a voucher plan. He printed a coupon bearing his signature on each package. A given number of coupons would earn the bearer one of a hundred items available in the Arbuckles’ catalog– the wish book of its day. 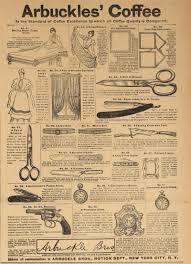 Items included everything from a toothbrush to a double-action revolver. 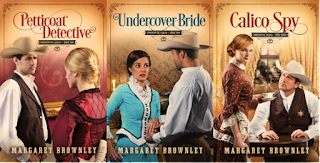 A young man could even order a golden wedding ring for his lady love. Claiming to mail out 80,000 rings a year, the Arbuckles' company became known as the biggest distributor of rings in the world. Not only was the coffee a life saver to those early westerners, so was the packaging. Coffee was shipped in sturdy Maine fir crates, 100 one-pound bags to the lot. The crates were used to make furniture, coffins and cradles. The Navajo Indians even used the wood to make hogans, and the trademark flying angel that emblazoned each package of coffee adorned many a western Christmas tree. The next time you brew a pot of coffee, just think: all this happened because a bunch of caffeinated animals got one man’s goat. Working Undercover is No Job for a Lady! Your last sentence made me chuckle Margaret...."all this happened because a bunch of caffeinated animals got one man’s goat"! I'll have to remember that when I drink my coffee in the morning...haha! Hi Trixi, now I'm curious. I'll have to pick up a copy of Erica's book. Enjoy your coffee! Hi Betti, Gotta love those goats! Thank you for stopping by.